Weebly : more than just a funny sounding name ! Kelly Breiner and Deborah Lazar introduced their "Stem Cell Controversy" Weeblyquest at this year's NICE mini-conference. Click Here to view and see more examples and tutorials. View more presentations from Ben Hazzard. 1)Wallwisher--add sticky notes to a wall; double click to open a sticky --aggregate ideas! immediacy factor. No need to set up an account. Use it to get feeback; share group reflections; Classroom students leave remarks while watching a video; students comment on themes - then collaboratively organize them. Also ask for feedback on a topic via twitter. You can add a YouTube video. You can add web links. You can pre-approve students comments. 2) delicious - tasty bookmarks! Bookmarks saved online and get to them anywhere. Social aspects...you can search others' delicious bookmarks. You can see how many have bookmarked a site, how people have tagged a site & who has bookmarked it & when! Can also combine others' tags to narrow your searches. Erika Eich suggested we use delicious book marks instead of webpage/categories. Can create an rss feed to someone's bookmarks; you can subscribe to the feed. You can put this feed into your google reader and updates will be automatic. Scuttle is a version of delicious you can set up behind a fire-wall. 3) edu.glogster.com -- open platform for creating multimedia posters Has huge library of images/audio to put on posters. Librarians can aggregate booktalks with this software. Teacher can set up accounts. Account set up will be changing soon. 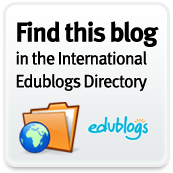 Can embed audio (to give students instructions), can embed video. Poster can link to articles. Students watch video, take a quiz. Great way to allow students to demonstrate what they have learned. Can be used as a classroom news letter. Could use for library pathfinders! Name the biome (based on viewing the word cloud)! Put State of the Union address and create wordle so that we can see what Obama has emphasized. Can use for different languages. 5)edmodo - (like Twitter, only designed by an educator!) Doesn't have randomness of Twitter. This is a closed community that you can set up for a classroom. You can set up some parts for others to see outside. Easy links to attach files and urls. Can mark things with assignments/due dates. Developed by Jeff O'Hara, --educator to be interviewed on ABC Channel 5 later this week. (Can embed Chalk interface into your Edmodo) Very cool feature. I really need to try this one!! 6)ipadio - drop dead easy way to do podcasts. Phonecast live to the world, any phone, anywhere! Is amazingly easy. Use your phone to dial in, totally free, and do your podcast. Enter your PIN number. Record, hit # and podcast is posted. Works on landline or cell phone. Also transcribes your podcast into text! Can get embed codes to put on your blogs. 7)kidblog.org drop dead simple. It's a WordPress product. Maintains editorial layers for student protection. Teacher registers and then creates student accounts. Student logs into classroom site with his own url. Cannot create own theme. Light weight yet robust system. There is an approve/disapprove function which works well for middle school students - moderation function. No frills super safe blogging for kids. 8) Voicethread Group conversations around videos, docs, images! Very interactive--multimedia slide show that holds images, documents, and videos and allows people to navigate pages and leave comments in 5 ways - using voice (with a mic or telephone), text, audio file, or video (via a webcam). Share a VoiceThread with friends, students, and colleagues for them to record comments too. 9) Poll Everywhere - Live Audience Polling; classroom response. Polls and voting; audience response system. Ask your audience a question. They answer using SMS text messages, Twitter, or the web. See real-time results in your web browser or PowerPoint. This worked well as we all texted our responses to Steve about our favorite Web 2.0 tool.Poll Everywhere is free for people who need to collect 30 or fewer responses per poll. 10)prezi This was the zooming presentation software used by Steve to show all the tools. They are expanding it to have an educator version and also a "re-use" feature which allows others to borrow your work and mash it up! I have used this great new product when I did a Facebook presentation last fall at ISLMA. Something to teach our students who are bored to death with PowerPoint. Today at the NICE conference Erika Eich, Julia Kessel, & Judy Gressel presented classroom uses for Photo Story. Examples featured were Chinese Language stories and Photo Story Book talks for a sophomore independent reading project. Click here to view PhotoStory Resources, including copyright friendly and copyleft sources for pictures and sound. 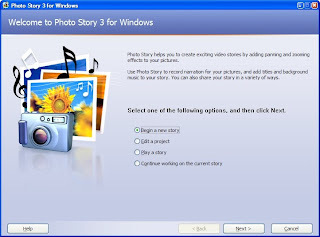 PhotoStory 3 is a free download from Microsoft and is a very simple light-weight program for creating digital stories. More ideas for classroom uses. See suggestions below. Spanish language - practicing four skills: listening, speaking, reading, writing. We will certainly add other suggested ideas. Introduction to your school -- Let students take pictures of people and places around the school. Import the pictures and let students narrate (from their written script), add some music. Use for Open House. Fieldtrips -- Take pictures during a fieldtrip, import them into Photostory, have the children sequence them, write a storyboard to go with the show, have the children narrate. Once the show is finished, you can run it during Open House or for guests. Interviews of parents, people in the community, siblings, school personnel, etc. Oral history projects would be great! Family Interviews -- Students interview a grandparent or other relative, then use pictures taken during the interview, or family photographs, to create a pictorial version of the interview. Mark Sample, a professor of Contemporary American Literature and New Media Studies in the English Department at George Mason University, in Fairfax, Virginia recently asked his blog readers to weigh in on whether they prefer URLs to be included in MLA bibliographies for websites. A whopping 74% agreed with him that website URLs should be included. (Take the poll). I agree with Mark that eliminating URLs for articles coming from databases like JSTOR is just fine as long as the journal name, volume and issue number are there. I would also agree that the exclusion of URLs from websites seems misguided when many web sites offer stable, concise permalinks. I will continue to train our Jr. theme research students to use URLs for websites as one way of distinguishing database materials for "born online" materials. Unfortunately the new MLA format uses "web" as the source whether it's a database or a website. This does not help students who don't recognize the difference. I just started following Jane Hart on Twitter. Apparently I am her first follower. the 140 University is just one part of Jane Hart's Centre for Learning & Performance Technologies (C4LPT). Twitter and Facebook are great places to discover and share new things. 140 University is a free service that provides you with classes in the form of knowledge nuggets and related links to web pages, videos, etc - in less than 140 characters. Explore the classes that you are interested in! * To comment on a class, use Facebook's Comment functionality. * To deliver your own class: leave the details in the Discussion Area and we will re-post it. Classes are organized by subject area and archived. Some of these "classes" or "knowledge nuggets" seem to be a compendium of trivia. Perhaps they will be a gateway for delving into a topic in more depth. What do YA's do in their free time? In between semesters when students have no assignments, they love to play "Wiki Races". What exactly is Wiki Races? It's an invented game played by boys who sit in close proximity on the computers. A student told me "only bros do it". They randomly pick a topic such as gorillas, find the wikipedia page, and then select another random topic such as Cuban Missle Crisis. Then students race each other to get info on the 2nd selected topic without actually searching. 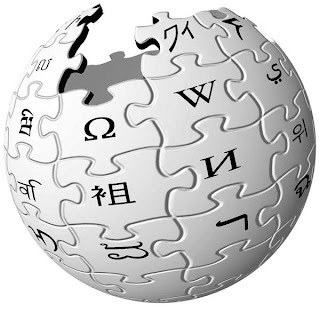 The "rules" are that they have to cleverly click through linked content on Wikipedia to hop, skip and jump their way to the 2nd selected random topic. The winner of Gorillas to Cuban Missile Crisis did it in 5 minutes. Rolling Stones to Footbinding took 15 minutes. (more esoteric) In only 3 minutes, a student was able to jump from John Adams to Dwayne (The Rock) Johnson, a wrestler. I quizzed them on their search strategies. They basically move from broad to specific. They mostly used the embedded links within the content (not external links). One student reported, "the more you know about a topic, the more routes there are to get there". This is definitely good practice for thinking about key words. 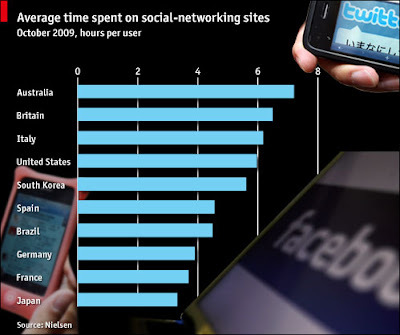 Do we really need to commit web 2.0 suicide or just regulate our time online? Just like everything else, maybe it's all about moderation. Social networking and connecting is one thing. Social isolation is another. Verbal communication is just as important as written communication, if not more important, and such interactions are a basic foundation of human nature. Maybe the thought should be....get online, send an invitation, and bring all the friends together in one place - in physical form. Now that would take care of "updates" for a few months. LibraryThing has rolled out Shelf Browse! Something New Trier Library should consider to augment the OPAC: Shelf Browse from LibraryThing. from Thingology (LibraryThing's ideas blog)---"Browse your library’s shelves visually, just as you would do in the physical library. Shelf Browse lets your patrons see where a book sits on your actual shelves, and what’s near it. It includes a “mini-browser” that sits on your detail pages, and a full-screen version, launched from the detail page." "Over the next couple of weeks, we are rolling out the ability for Google Apps users to easily upload and securely share any type of file internally and externally using Google Docs. You get 1 GB of storage per user, and you can upload files up to 250 MB in size." I was looking into finding more info on YouTube access for students when I was directed by the awesome Educator's PLN Ning to Michael Wesch's work with YouTube. Inadvertently I came across his recent discussion on using the power of smart mobs to enhance classroom discussion. Read Prof. Wesch's recent blog post from his Digital Ethnography class at Kansas State Univ: How to get students to find and read 94 articles before the next class. I am looking into other articles of this nature by Googling Smart Mobs. When I use the wonder wheel, I am able to find other keywords such as crowd sourcing, "wisdom of crowds", and Jeff Howe's work in this area. Don't forget the power of the wonder wheel when teaching keywords; visual learners will benefit from this graphical way to explore topics by clicking on related searches that dig deeper. From the wiki: "Think about all the links you miss during the school day. Imagine if those links were accompanied by a hashtag that would make it easier to search by topic." Add your own hastags! Help build this PLN. This wiki was just created on January 1 and in less than 2 weeks, the power of the mob will turn it into quite a nice personal learning network. This new TED Talk is catching on: educator Kiran Bir Sethi shows how her groundbreaking Riverside School in India teaches kids life's most valuable lesson: "I can." Watch her students take local issues into their own hands, lead other young people, even educate their parents. This week, pbs said: New Research Reveals PreK-12 Educators Increasingly Value and Use Digital Media. The annual PBS/Grunwald survey, "Digitally Inclined," was released Tuesday. The survey includes data collected from pre-K educators for the first time and reveals the growing use of digital media among educators. Here's a link to the release for more details and to download a free copy of the survey. Take a look at Memidex, a free dictionary and thesaurus. It offers multiple definitions and suggests synonyms. English language learners will find it especially helpful. For instance, I looked up "class" and it gave me separate links to 15 definitions, some having to do with education, elegance or social standing, biology, and the abbreviation for classified advertising. With so many synonyms and examples of specific uses, Memidex is a great compliment to OneLook or dictionary.com, a student favorite which allows users to improve vocabulary by signing up for an email word of the day. Be sure to check out RefSeek's guide to the 25 best online resources for finding and viewing educational videos. "With the exception of BrainPOP and Cosmeo, all listed sites offer their extensive video libraries for free and without registration." One that I definitely intend to explore further is ResearchChannel, founded by a consortium of leading research and academic institutions which share the valuable work of their researchers. Their library houses more than 3,500 full-length programs, including thousands of interviews with leading thinkers.